Home - Pennsylvania - What is CPR? Philadelphia residents need to know. What is CPR? Philadelphia residents need to know. CPR is a first aid method of response called “Cardiopulmonary resuscitation”. This is a technique that is used in an attempt to rescue a person who has gone into cardiac arrest. CPR training is recommended by the American Heart Association and is something that everyone should learn how to do, even if you are not a trained medical or paramedic professional, in the event that you are able to rescue a person close to you having a medical emergency. For Untrained persons: If you have never been trained in CPR rescue then it is best that you only give the victim chest compressions at the rate of 100 to 120 per minute until medical personnel (EMTs) arrive. There is no need for any rescue breathing to take place. If you have CPR training but not very confident or feeling a little out of sorts with the procedure, then you should only do chest compressions at the rate of 100 to 120 per minute until help arrives. Everyone should take a CPR class so they can be prepared to step in and help. In-Pulse CPR , an American Heart Training Center, is offering CPR, AED, and first aid training certification classes in Philadelphia several times a week with multiple class sites to ensure that everyone (not only nurses and emergency personnel) is well equipped to handle a medical emergency. Imagine the following scenario: you are at work or the supermarket and the man or woman in front of you suddenly collapses, grabbing onto their chest. Would you know what to do? Wouldn’t you rather be able to do as the person in the image is doing and start chest compressions right away? This is a scenario that could happen to anyone – and it does happen every day. CPR is a life saving technique that can mean literally life or death to a person suffering from cardiac arrest. Do not worry that you may break their ribs—this is usually going to happen anyway. 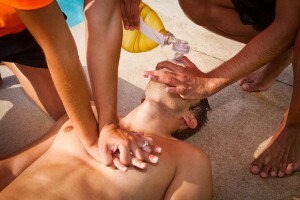 The main purpose of the CPR technique is to keep the flow oxygen within the blood stream until emergency personnel arrives and can begin a more advanced form of life support. Sign up today for one of the In-Pulse CPR classes being offered in the Philadelphia area today. Training classes are offered in groups of five to all private, corporate and non-profit organizations.